Create IT Landscape diagrams yourself starting with a Trial Account here. This is an example IT Landscape Diagram created on Dragon1. Dragon1 is a collaboration platform, on which you as Business Professional can learn, create, share and control interactive content with the Step-by-Step Guide on the Help. By creating an IT or Business Landscape like this you save costs, and you are able to manage your issues. Just import or enter data in the reference model and create your own views using this visualization template. Read on how this is done on the Dragon1 Platform. 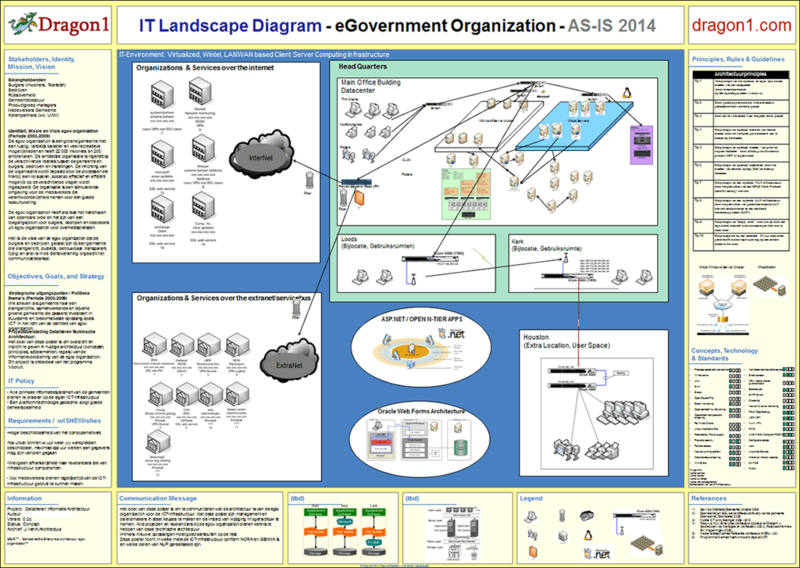 What is an IT Landscape Diagram? An IT Landscape Dragon1 is a simplified Dragon1 architecture drawing showing the appearance, structure and workings of IT in an organization. In more detail, an IT Landscape itself, is a coherent set of interconnected IT parts, like hardware and software within an enterprise, business or organization. It shows the structure, grouping, modularity, functionality and technology of the complete IT environment. An IT Landscape Diagram also can show the relationships between IT functions, IT services, IT capabilities, IT activities, IT objects, departments, roles, competencies, locations and IT sub-environments (like development, test, acceptance and production). Speed up Results You can have your version of the IT landscape diagram after days by only updating the example. Repository Collaboration You can be productive as a team working together on IT landscapes. So, when ever you as IT-architect need to show a manager how the IT landscape works or is structured in order to provide IT services to the business and how these services depends on other IT parts, just create an IT Landscape Diagram on Dragon1. We hope we have inspired you to start creating it landscape diagrams. If you do not have the time and you need an IT Landscape on short notice, we can create a Landscape for you.